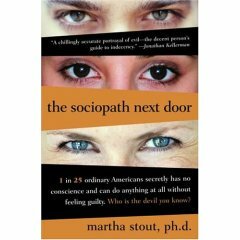 About a month ago, I breezed through The Sociopath Next Door: The Ruthless Versus the Rest of Us (2005) by Martha Stout, a PhD and practicing clinical psychologist. This is one of the more engaging psychoreads you will find; it is highly recommended. The book is not about serial killers, it's about your first boss. Or you sister's ex-husband. Or that creepy member you kind of got to know when you were a missionary. You will be probably be surprised who this book is about. I was. Nice cover — disturbing but not graphic. The author claims about 1 in 25 Americans are sociopaths, so you have probably dealt with one or two. What is a sociopath? According to Stout, it is a person with no (or very low) emotional responses. In simple terms, they don't feel guilt or love or duty or shame the way we do. This doesn't, of course, make them criminal per se, but it does open up some interesting possibilities, doesn't it? They are inclined to be opportunistic and manipulative, but not pariahs. Far from it — sociopaths may be quite successful in worldly terms, if not in personal or emotional terms. But they leave a trail of hurt or cheated people in their wake. The essential point to grasp from the book, however, is not that sociopaths are unemotive, but that they are often very good at feigning emotion. They become good actors, which is more or less what they are doing whenever they display emotions. You or I might try to feign emotional displays sometimes, but we aren't very good at it. We don't get that much practice, and we generally feel guilty about manipulating others through fake emotions. But sociopaths get lots of practice (like since childhood) and don't feel any guilt about manipulating us. They enjoy it; it's the thrill in their life, manipulating emotional suckers like you and me. So how do you recognize a sociopath? For that, you'll have to read the book, there's only so much I can do in a five-paragraph note. Two simple rules: (1) Three lies equals one sociopath. (2) Beware the pity play. And what do you do if you discover you are dealing with someone like this right now? Read the book, and be careful. Finally, consider the most distressing reflection I've read on sociopaths: If a modern corporation (a person in the eyes of the law for many purposes) were assessed in terms of its personality and conduct, it might very well be diagnosed as a sociopath. That thought is not from the book, but perhaps it ought to be discussed in the sequel. You might also want to take a look at the book entitled Why is it always about you? Saving yourself from the narcissists in your life by Sandy Hotchkiss. She discusses the developmental reasons why people become narcissists (a.k.a, sociopaths) and how to deal with them constructively. I don't know if I like the underlying implications of the book you are reading. It's hard enough for each of us to trust and love each other as neighbors, if we believe there is a signifiant amount of people out there who are untrustworthy, it makes it that much harder for us to follow the Savior's admonition to "love thy neighbor as thyself". In Soren Kierkegaard's book "Works of Love" he argues that in order for us to truly love our neighbors, we must first assume the best about them, and assume that they have the best of intentions and love in their own heart. Only then can we properly love them. There is no way for us to know the intentions of other people's hearts (regardless of what the behaviorists say) so we must choose how we wish to judge others, but in choosing we judge ourselves, or as Kierkegaard says, we "disclose" ourselves to the world. We make known what's in our own heart. Wow. I need to add that one to my reading list too. Thanks Dave. BTW -- I think we have a sociopath or two that haunt the 'Nacle as well. Kurt, I actually read the Hotchkiss book about a year ago. It is posted under General Books on my left sidebar toward the bottom. According to Stout, narcissists are not sociopaths; they have plenty of emotional response, it's just all oriented around themselves. But the two types do seem do display some of the same tendencies to manipulate those around them. Craig, there's nothing wrong with having a desire to protect oneself (and one's family members) from scheming sociopaths, and you can't do that unless you have an idea these people are out there and may cross your path. I don't really care whether obsessive, introverted Kierkegard might think I'm being uncharitable. Geoff, thank you for not naming names. How would someone ever be able to make an accurate statistic of who is a sociopath and who is not. You can say that 1 in 25 people have a low or no emotional response, but how would you know that? Behaviorists would tell you that you can tell by the way they behave, but I think Behaviorists are full of it. I say, "I'm happy," they say, "no your not," and I ask "how do you know?" and they say "because your behavior reveals that your not happy." Even if I'm happy, I would never be able prove to them that I am. I think this book likes to exploit the desire people have to analyze others, and also the fear people feel towards the unknownable. I have to admit, as I read your article I found myself wanting to read this book, I think analyzing the way the human mind works if fascinating. But, that doesn't make him right. Surely, we all have to assume that sometimes people are not being forthwright and honest. I think everyone knows that. Being educated about the more subtle tactics of nasty people we my come into contact with is a valuable life skill and the more we know, the better. Dave-The thought of the actions of a corporation as a sociopath is interesting. I guess the group of investors, when behind the mask of the company, act, or want the board to act in a manner comparable to a sociopath. I can see the trend reversing a bit over the past decade though, with 'green' and 'foreign labor friendly' companies seen as more atractive both publically and finacially. You don’t have to know the secret signs to follow the teachings of Master Mahan: “. . . murder and get gain”. Although it may not be the actual taking of life, there are some who would destroy another’s reputation thinking that it would build their own (the old zero sum game, one of Satan’s best tools). Whatever it takes to be Relief Society President, Elder’s Quorum President, Bishop, etc. But I still work to build Zion and look forward to that day when we can all live in peace and work for our brother’s well-being. Nice comments, Floyd. I think bishops ought to read this book to be aware of the fact that there are sociopathic individuals that they will deal with as bishop, who will lie and try to manipulate a bishop for their own purposes. Bishops can also benefit, I think from having some understanding of the difficulties of regular people who are recovering from a bad experience with a sociopath, whether that be at work, the family, or the ward. On the positive side, Stout makes it clear that sociopaths are not long-term successes. Their lives/jobs/relationships tend to self-destruct before too long. Lacking emotions is, in fact, a serious life handicap. One of the nice discoveries of the book is how effectively our emotions help us maintain balanced and stable relationships. Emotions sometimes create friction, but also provide guidance and cohesion to our social relationships in all contexts. I don't think one has to be a Bishop long before one quickly realizes that many of the people one deals with have serious mental and emotional issues (or have issues with people with those problems). The big issue for Bishops isn't whether there are psychopaths out there. The big issue is knowing what to do about it. Not just psychopaths, but also bipolar disorder, schizophrenia, and even extreme depression. One of many reasons why I'd never wish to be a Bishop. "But sociopaths get lots of practice (like since childhood) and don't feel any guilt about manipulating us. They enjoy it; it's the thrill in their life, manipulating emotional suckers like you and me." If a modern corporation (a person in the eyes of the law for many purposes) were assessed in terms of its personality and conduct, it might very well be diagnosed as a sociopath. That thought is not from the book, but perhaps it ought to be discussed in the sequel. Actually there was a recent documentary film called The Corporation which made exactly that argument. Ciaran, it was the reference to The Corporation in the Wikipedia entry on sociopaths (which I linked to in the post) that raised the interesting idea that corporations behave like sociopaths. And "corporations" is not, to my mind, restricted to for-profit commercial corporations: the generic sense of "corporation" extends to government, the military, non-profits, and churches. To paraphrase Nibley, these days Satan is best thought of as wearing a suit and tie. I haven't seen the documentary yet. As a card-carrying Netflix member, I can probably get it delivered to my doorstep in three days, however. Yes, there are evil people around, but Stout's alarmist, fluffy little book isn't that helpful in dealing with them. RW, sorry if Sociopath wasn't an instant winner with you, but I'm sure you'll thank me someday. For another blog review of Sociopath that, I must humbly confess, is even more entertaining than mine, check out Bookslut's review. Quick points: I don't think Stout was milking her subject for scare points, which would have been easy to do. She went out of her way to emphasize that relatively few sociopaths are violent or criminal. [Sociopaths] are also egocentric, impulsive, and lacking in the emotions of shame, guilt, and remorse. ... [S]ociopaths realize they are more coldhearted and selfish than other people, but this fact does not bother them. Although they make up only about 3 percent to 4 percent of the male population (there are fewer female sociopaths), sociopaths make up a high percentage (approximately 20 percent) of the prison inmates in the United States. Their crimes typically involve deceiving and manipulating other people: fraud, bigamy, and embezzlement. Gaulin and McBurney, Evolutionary Psychology (2d ed., 2004), p. 248. Hey, what's with the half-hearted attempt at an accusation? Surely, if we're going to be sincere and honest about it, we need to name some names here. In all seriousness, I'm not sure I understand the motivation for making such a statement. If 1 out of 25 is a sociopath, as was stated above, it's a given (provided there's participation from more than 25 people here) that someone's likely to qualify. Was this an encouragement to speculate?